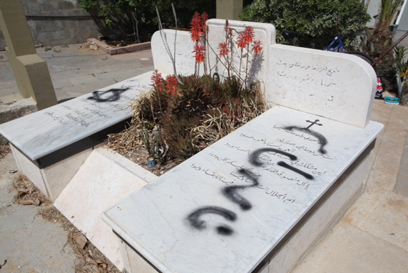 Unknown vandals desecrated the Christian Orthodox cemetery in Jaffa and spray-painted the words "revenge" and "price tag" on several tombstones. "Price tag" graffiti was also found on a residential building near the cemetery where Tel Aviv District Judge Khaled Kaboub resides. Police launched an investigation but no suspects have been apprehended as of yet. Jaffa's Arab residents were outraged after learning of the vandalism and criticized the government and the police for failing to curb the phenomenon. "These are dangerous acts which are driven by hatred to Jaffa's residents," said Attorney Ahmed Balha, a political and social activist. "Price tag has become a phenomenon. These acts are extremely offensive especially when it comes to sacred places." He further added, "Unfortunately we have yet to see any steps taken by the State against this phenomenon and this encourages similar acts." Attorney Balha said an urgent meeting will be held later on Thursday to decide on steps to battle the phenomenon. 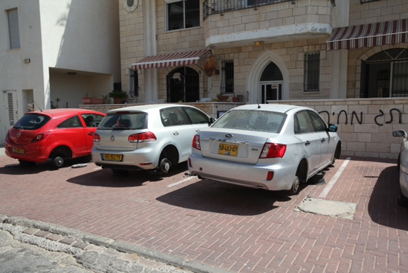 Jaffa resident Mahmoud Aghabria said, "This is a criminal act that mustn't be ignored. Racism in Jaffa is spreading and we fear that the government and the police are not doing anything to those who are behind the 'price tag' acts. If Arabs had desecrated a Jewish cemetery I'm sure arrests would have been made within hours." Daam party chairwoman Asma Agbaria-Zahalka said in response, "Price tag is a whitewashed name for the terror squads that receive government immunity. The government encourages the settlers at the expense of other citizens' welfare and refuses any peace negotiations. "The incident in Jaffa shows that the boundaries separating Israel and Palestine have become blurred." See all talkbacks "Christian cemetery in Jaffa desecrated"